Dream Catcher - Luxury Glamping with PodPads. Luxury Camping or "glamping" at a festival is definitely something I can get on board on. Whenever we usually go to a music festival we jampack our car with tons of essentials to get us through the weekend and nearly always forget something or other. Also, it's a hefty mission attempting to carry all our belongings from the car park to where we'll be camping and then back again at the end of the festival. Therefore, any opportunity for some "luxury" whilst at a music festival is definitely welcomed. 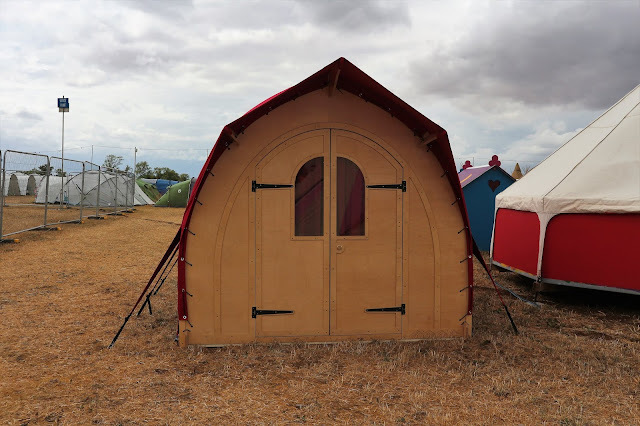 Recently we were able to experience glamping at a music festival when luxury camping brand PodPads allowed us to test drive their new product, the Dream Catcher at Womad Festival. PodPads offer an alternative to traditional camping that allows you to leave less luggage at home and bring just the clothing and foodie essentials to get you through. One of the biggest appeals for us was that there were more facilities available to us that weren't available throughout the festival's campsite. We were able to access things like upgraded toilets and washroom facilities, phone charge outlets, tea & coffee stations and The Pink Pamper Show Pamper Parlour where we could dry and style our hair. 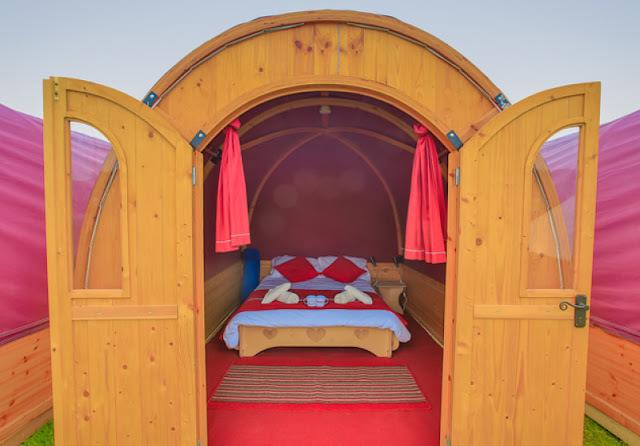 The luxury camping brand provides pre-pitched accommodation and can tailor size groups from 2-8 people. The Dream Catcher feels very much luxurious in comparison to traditional camping. The pod contained mains 240v electricity which came in handy to charge up our phones after snapping photos from the festival all day. We had the luxury of a double bed that came with foam mattresses, fitted sheets, duvets and pillows. Unfortunately for us, our bed wasn't that comfortable and we found it difficult to sleep. The fitted sheet didn't fit the bed very well so we did spend a lot of time trying to get it back on. Our Dream Catcher also came with fantastic bed throws, scatter cushions, bath towels and hand towels to make our stay as comfortable as possible. It does come with its own key which means your belongings are safe whilst you are in the festival's arena. It definitely made us feel safe whilst we were sleeping. Our Dream Catcher was advertised to come with 2 camping chairs, camping table, lantern and coat hooks but we didn't have these located in our pod. We could have definitely done with the coat hooks after the rainfall as it meant soaking our own camping chairs in the process of trying to store them to dry. These things slightly dampened our experience in the Dream Catcher, to be honest. Luckily, we had brought our own camping chairs for the festival so I'm glad we remembered to bring these with us! The Dream Catcher did bode pretty well when the heavens opened during the weekend, it was incredibly noisy but we managed to stay well sheltered. I'd definitely like to give another Glamping experience a go with PodPads, it was unfortunate that some things were missed from our list that was supposed to be included in our stay. The staff on-site were extremely helpful and accommodating, especially when we had to leave early Sunday morning due to the weather. You should definitely check out what PodPads has to offer you for a unique glamping experience on their website here. If you enjoyed reading this post then you may enjoy reading my other Glamping experience at New Farm Holidays in Lincolnshire. They look like such a good alternative to a tent!